Cheesmans is registered to carry out audit work by the Institute of Chartered Accountants in England and Wales, the Institute of Chartered Accountants in Scotland and the Institute of Chartered Accountants in Ireland. We have experience in auditing public companies and private companies whether small, medium or large. 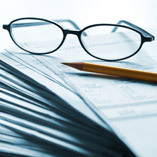 We have provided answers to some frequently asked questions on auditing. Who is required to have audited accounts? An audit is required if two out of three of the following cross a specific audit threshold: annual turnover; value of assets; number of employees. To view the latest audit thresholds, click here. An audit can be undertaken even if your company doesn’t meet the mandatory thresholds, and it can be prudent to undertake an audit if your turnover, assets and/or number of employees are close to the thresholds.